My radio DJ husband reorganized his massive collection of CDs, and discovered that he no longer needed this dandy metal rack. 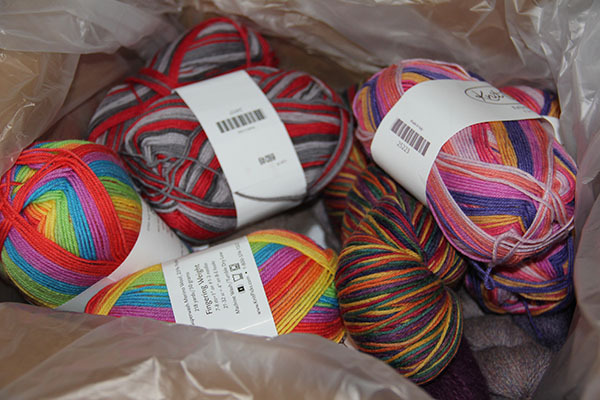 So I snagged it for my yarn. 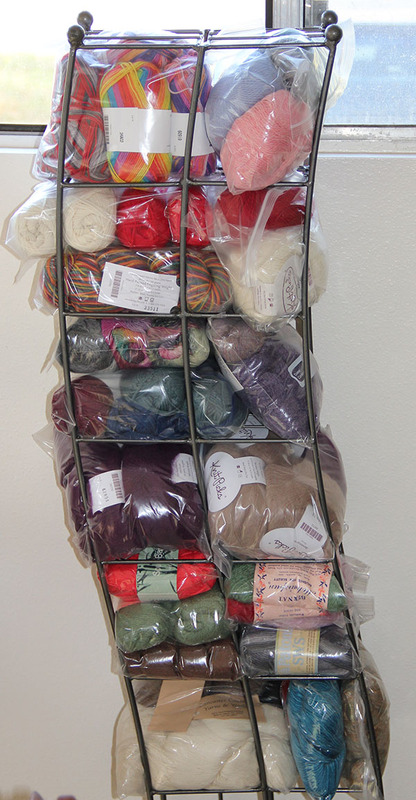 Or more accurately, a modest portion of my current yarn stash. The rest is still boxed up in the closet. I made it a point to put all the really enticing skeins out in the open, so they will remind me to knit with what I’ve got instead of buying more. Waiting for my latest yarn order to arrive at the post office is like watching for the Wells Fargo Wagon of yore. Today, at long last, it came. 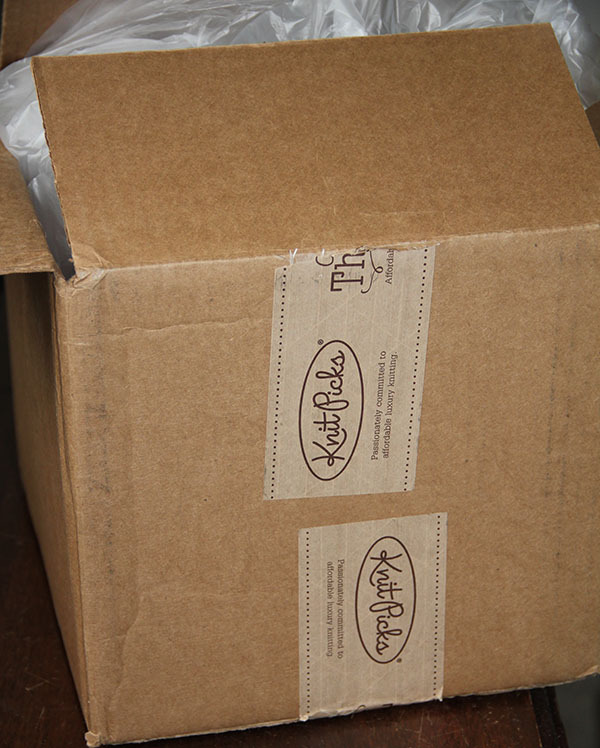 It didn’t take long for me to attack the box with a pair of scissors, revealing the soft, colorful bounty within. I’d always laughed (albeit with a touch of the sour grape) at mechanical wool winders. What a lazy person who won’t make their own balls of yarn. Then I inherited this one, amongst a vast store of needlework tools from my grandmother, and I suddenly see the light. 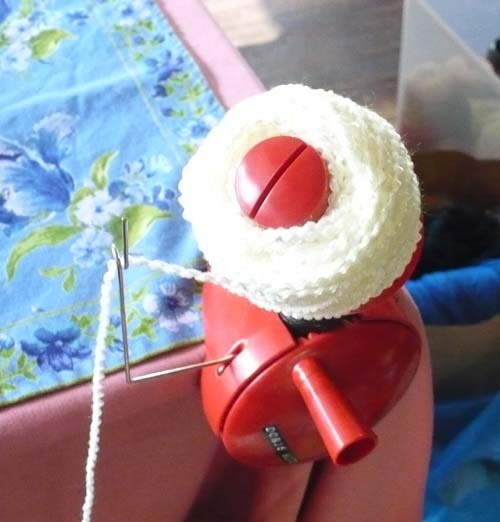 In seconds, a messy skein becomes a perfectly wrapped unit — better than a ball. The tension is perfectly controlled, as is the shape and placement of each overlapping strand.